We’re now on the verge of health care Armageddon: Senate Republicans have voted to move forward and consider their mystery bill to repeal the Affordable Care Act—and take away health care from millions of Americans. Here’s how we can punish them. decade, and GOP Sen. Dean Heller only won in 2012 by a single point. Democrats have landed a top-tier recruit in Rep. Jacky Rosen. Arizona: Republican Sen. Jeff Flake won’t be easy to beat, but Arizona moved sharply in the Democratic direction last year, as Trump won it by just 3.5 points. (Mitt Romney won it by 9.) Flake, meanwile, prevailed in 2012 by only 3 points, but we still need a strong challenger here. Texas: Texas is a much, much harder hill to climb, but in a wave election, a win here can’t be ruled out. Trump’s performance was the worst by a Republican presidential candidate in Texas in 20 years, and Ted Cruz—yeah, Cruz—has never faced a competitive general election. Rep. Beto O’Rourke has announced a bid here, giving Democrats a credible candidate. And this is important: Heller, Flake, and Cruz all voted in favor of proceeding with their party’s healthcare repeal. Daily Kos isn’t taking sides in any potential primaries in these three states, but we can—we must—act immediately. That’s why we’re raising money for ActBlue’s “nominee funds” for each of these races, and you can contribute to these funds right now. All money is held in escrow until after each state’s primary; at that point, the cash is transferred in one fell swoop to the Democratic nominee, who can then start using the money for his or her general election campaign pronto. 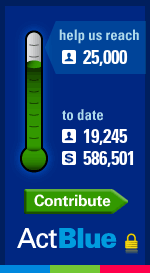 If we can make the digital mercury in that thermometer soar, Democrats, Republicans, and the media will take notice. It’ll help boost candidate recruitment, it’ll increase the visibility of all of these races, and, most importantly, it’ll give our candidates a big fat bankroll that they can put to work the moment they win their primaries. And they’re going to need every penny, because the GOP is going to fight to the death to cling to power. So make them pay for voting to destroy health care: Donate $1 right now to each of the Democratic nominee funds targeting Senate Republicans.